This is probably the best way I have ever seen to store hand guns. The Versatile Gun Racks are vinyl coated welded steel wire frames that will not only store your hand guns but will protect the finish of your favorite weapon. No matter what size gun safe you have Versatile Rack has the gun rack for you. Use the the stacking kit to build up your rack or use the peg board kit to hang your pistol on the wall. No longer will you have to deal with a cluttered, unorganized gun safe. Versatile Gun Racks are affordable and will last a lifetime. Are you tired of just stacking your hand guns in your gun safe? Do you still get upset when you see yet another scratch on the nice finish of your expensive Glock? Versatile Gun racks has the solution for you. Now you can stack your hand guns neatly in your gun safe and not have to worry about it looking like a mess or the guns scratching each other. Versatile Gun Racks are designed for function and versatility. Unpack them, stack them and rack them. The folks at Versatile Rack Company have done a nice job designing and manufacturing gun racks right here in the United States. In fact these stylish, vinyl coated gun racks will protect your guns finish. Choose the stacking style or the peg board style. So if you’re looking for a gun rack to organize your gun safe, or for a pag board rack for your gun, choose Versatile Gun Racks. What’s on your peg board? If you’re a handgun owner you may want to consider one of our peg board pistol racks. The Versatile gun racks are made of steel wire and double coated vinyl to protect your gun’s finish. If a peg board isn’t available, don’t worry we’ll include a mounting bracket and hardware for you to install your peg board gun rack anywhere you choose. How do you maximize the space in your gun safe? It’s simple really. Use a Versatile Gun Rack. Versatile Gun Racks are made in the U.S.A. and are perfect to be used at the shooting range, at home while you clean your guns or even for display purposes at your retail outlet. Preserve the finish on your favorite weapon with a Versatile Gun Rack. Is your gun safe a mess? If your gun safe is cluttered, just know it doesn’t have to be. The folks at Versatile Gun racks have what you need. Whether you own one hand gun or ten they have the solution for you. Size doesn’t matter either. Use their gun racks when you go to the range or at home when you’re cleaning them. These gun racks are great. In order to improve your skills with anything you must practice, practice, practice. This includes sport of archery. Honing your archery skills will also improve your focus and discipline. You can set up your own target range in your backyard. Be sure to step off the proper yardage and use a flat field facing the woods. You’ll want to mark the spots with a stake so that when you take your targets down you easily set up again at a later date. I like to use a bow spike from Versatile Gun Racks so that when I’m practicing I don’t have to lay my expensive equipment on the ground. When we go on our camping and hunting trips, packing the SUV is a breeze because we have the gun racks in the back with plenty of room left over for the gear and luggage. The trick for us is getting all of the gear from the vehicle to the remote cabin deep in the woods. Owning an ATV gives us plenty of options. Saddle bags, gun racks and a nice cargo box suit us well. Maybe it’s just me but when I think of a gun rack I think of a pick-up truck with maybe an extended cab and a gun rack in the back window with one or two rifles hanging on them. Little did I know that there are many wants and needs for gun racks. Hunters and campers put them on their ATV’s for when they are out in the woods or on a trail. Versatile Gun Racks offers an option for gun safe owners. No longer do you just throw the hand guns into your gun safe in a pile. Now you can neatly organize you hand guns inside your safe. There is even a peg board version that you can mount on your wall. Why Would You Lay Your Stuff On The Ground? When you go to the range for some target practice there isn’t always a place to put your shotgun or rifle. You don’t really want to just lay your expensive rifle on the dirt or sand and then have to wipe it down before you use it would you? 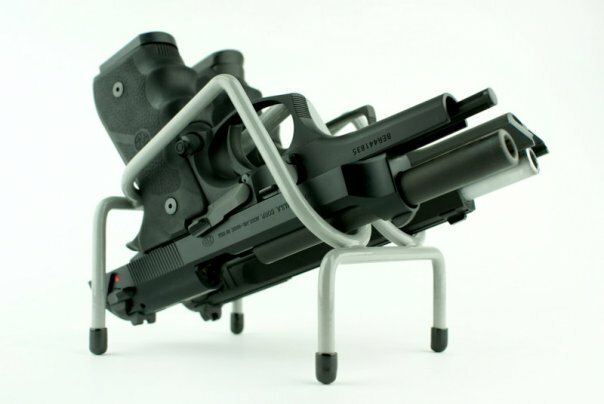 Well the folks at Versatile Gun Racks has come up with a solution. These are the same people who bring you the wonderful powder coated gun safe organizers. Introducing the Versatile Campsite kit, featuring a welded steel frame and powder coat finish, built to last a very long time. The campsite kit is ideal for taking to the range or even on your next hunting trip.